Shallow ocean they’d have the same type of patches as normal ocean regions but obviously they’d have less depth. Also we may have to make new types of seafloors since they can be at any depth. Coastal for estuaries and tidepools (and any new biome that is in contact with dry land like rivers or even aquifers). 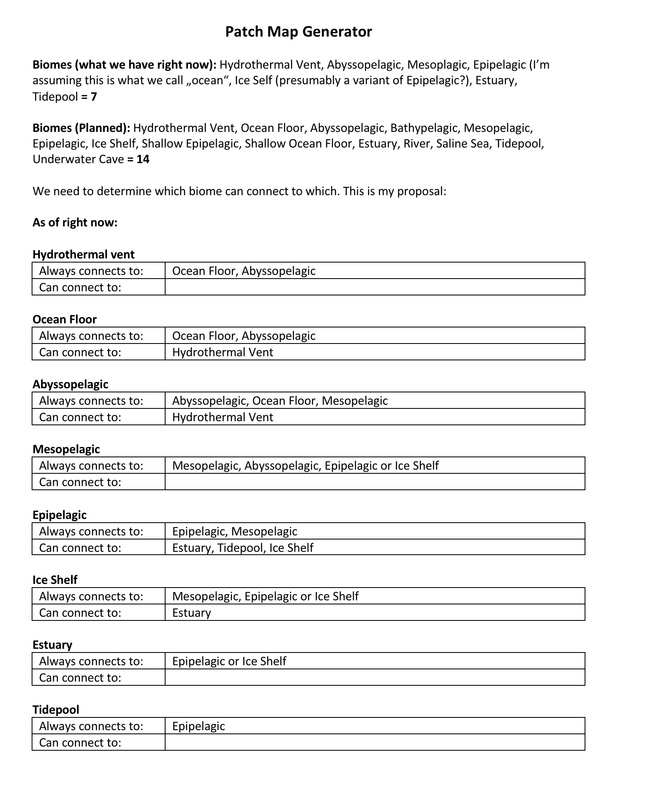 Biomes like caves and ice shelves (and maybe sea vents) could appear in any region, as long as it makes sense (you won’t see ice shelves on a subtropical ocean) and their properties should be coherent with the region they are in (a sea vent located in a shallow ocean (not sure if that’s possible) would have a higher light level than one in an abyss). We could show fading lines on unocupied patches and regions, this would imply there are more patches conected to the ones you already see. However, I think showing adjacent patches is a good enough incentive for the player to explore their world. They’ll start at the botom of the ocean after all, so they will understand this mecanic once they ascend to the abyss and see that new patches appear on their map. Btw I really like the mesopelagic icon you made! Yeah interesting points. I think the idea of clustering the biomes is an interesting one. Having rectangles for deep ocean, others for shallow and then others for coastal and land patches does make sense I think. Here’s another example with more rectangular patches. The connections are still a bit of a mess. All feedback welcome, is this a good direction to be heading in? This isn’t particularly how I imagined the patch map originally however I think this approach might pay off. It could look quite cool I think. It does look cool, not sure I fully understand what’s going on with it though. Are there some regions that don’t have any higher-depth patches above them? Atm this is just procedurally drawaing a bunch of boxes with blobs in and connecting them with lines. So yeah it doesn’t really mean anything yet I think. 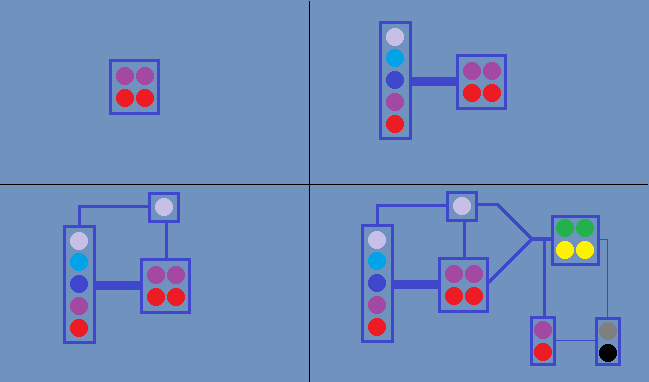 We’d have to work out rules for which patches can go in the same box as others, when boxes are connected, whether those connection lines can cross, how far they can go etc. Well that’s weird because it looks like that previous concept you posted follows pretty much the same principles as mine. I’ve noticed that there are some errors on my map tho: the green 4 and 5 patches shouldn’t be on the same region since they aren’t actually conected with eachother. Maybe that’s what confuses you? Also keep in mind that this map only shows the patches on northern hemisphere, I could make a complete map tho if that helps you understand it better. I think my thinking on it is a little different. We could put a bunch of nodes down on a plane and then connect them up with lines, that’s kind of what I did with this prototype. 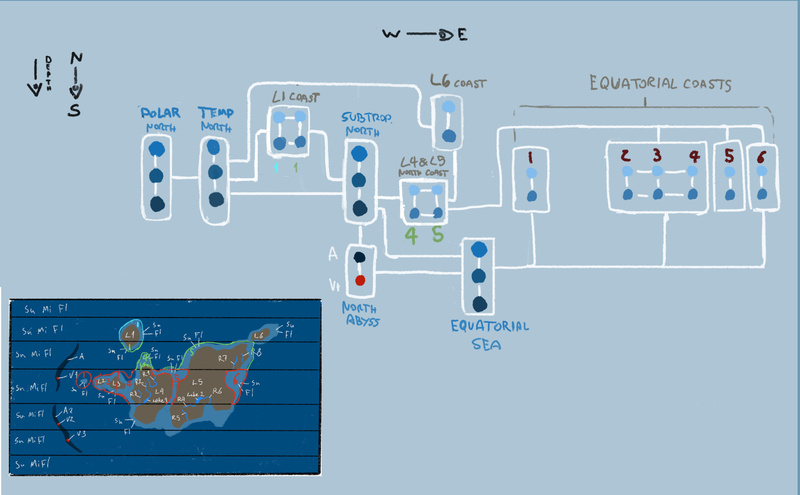 It works and I’m a bit concerned it will end up as a tangled web of lines that is a bit confusing. We could do a Delauny triangulation on it or something, that would be reasonable. So I think one possible solution to that is to group the patches into “regions” ( a circle or rectangle which contains a bunch of patches) and then have a rule that you can move from any patch in a region to any other, i.e. they are all densely connected. Moving from one region to another is a bigger deal. The regions could be things like a column of water in the ocean or they could be more horizontal / thematic where maybe a vent, some ocean floor and a couple of deep oceans are together and then somewhere else there’s a coastal and a few tide pools all grouped together. I think this might make the map easier to read by reducing the number of connections quite a lot and might look quite nice, though that’s much more your department than mine. I’m not thinking every time a deep ocean patch is present then automatically it includes the whole column of water above it, but that would be possible. The patches above the abyss are in the subtropical northern ocean. Of course, that abyss is also conected to the equatorial ocean which, now that I think of it, it should be above the abyss as well. I should make a cleaner version of this in the future. Making horizontal regions could work too as long as they don’t have to many patches, they shouldn’t get too wide. The thought of being able to move freely within a „region“ really doesn‘t feel right to me. That basically means that you just could skip from the abyssal area to the surface, without having to inhabit the mesopelagic first, right? The map might look nice and clean in that case, but this really feels unrealistic to me. This proposal of @DonGororo would be ideal I think. Everything would look nice and clean, but you couldn‘t move from the ocean floor to the surface or anything like that. Yeah that’s a good point. I agree there should be rules on which patches you can move between and if they are very far apart in depth it makes sense you need an intermediate step. I think what we’re really trying to do here is to teach a computer how to draw nice patch maps when given planet variables. I think this is an interesting project because it needs all of our skills to be pooled to produce something really good. It’s got to look nice (art team), respond to the changing planetary variables smoothly (programming + theory), a computer needs to have a list of rules from which it can draw the map (programming + theory) and it needs to have good gameplay (gameplay = everyone). I think we’ve got the potential to make something pretty great which is better than anything any one of us could produce so thanks everyone who is contributing, I think this is a cool process. I like your thoughts goro about working out a grid pattern for how to layout patches, that’s the sort of thing we need to do, have a list of rules from which the map is drawn. Re geography I think it’s helpful to detach from the idea of geography as that actually gives us a lot of freedom. I haven’t had time to prototype this yet but I think one idea that might look great is if we start in the middle of the map, put down a region (rectangle maybe). Then iteratively we can put down a new region near those already placed and connect it with lines to those that are already there, such that the lines don’t cross. This means it will grow kind of like a snowflake or something which I think could look really good. On reflection I like the idea of vertical stacks of ocean patches because of the marine snow , as you were saying Naro. 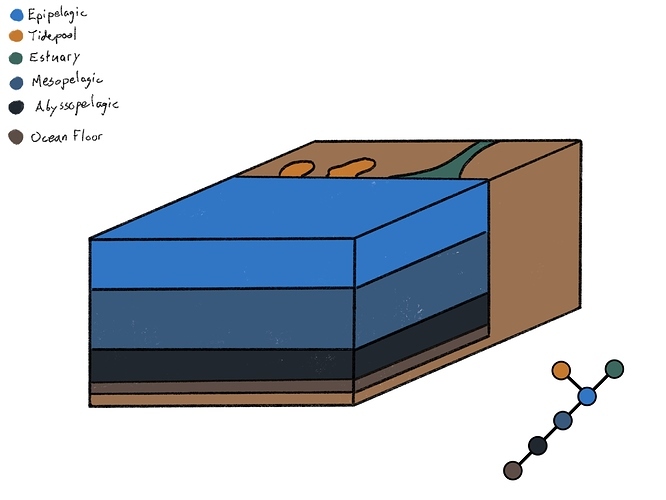 The main energy source in mid ocean patches, where it’s too dark for sunlight, there’s no H2S source and no iron will be debris falling from above, so having the patches in a stack makes computing this really easy. I also wondered about maybe different thicknesses of connection? So some region to region connections are really easy to cross, shown as thick lines, (maybe between two close regions of ocean) and maybe some are hard to cross, shown as thin lines, like into an underwater cave with a narrow entrance. Might add some interest to the flow of species. Maybe when you move some of your pop to the new patch less of them make it through a thin connection. Anyone have thoughts about that? I also wondered about maybe different thicknesses of connection? So some region to region connections are really easy to cross, shown as thick lines, (maybe between two close regions of ocean) and maybe some are hard to cross, shown as thin lines, like into an underwater cave with a narrow entrance. 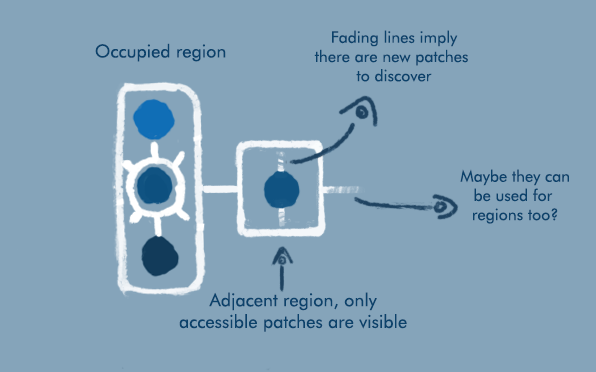 But seriously, this is an interesting idea, maybe ocean currents could gate the way to new patches? Also, what would be the incentive for the player to leave their cozy sea vent? If I recall correctly, that kind of patches would have a lot of resources, but the ones above them would be more barren. Maybe once the vent gets overpopulated they will have to venture outside? Or maybe all patches will start with a high level of resources that will decrease over time? Yeah Crodnu brought that up and I thought it was a good point, we should encourage spreading. I like the idea of an overpopulation penalty, where if you have a lot of pop in a patch it becomes harder to get more, which means you are incetivised to spread out, also yeah having starting resources in each patch means getting out early is good. So both nice ideas there. Ok I did some more work on the prototype today. I implemented a new generation algorithm which has two nice properties, none of the connection lines cross (though they come close) and all the patches are certainly connected to the network, which I think are kind of important. Is everyone ok with this being the design we go forward with? I guess this is probably a good time to check in case anyone wants a major redesign. Personally I am reasonably ok with it, I think it’s not quite visually strong enough yet but we can work on that, also I think mechanically it will be fine. Have a think about it and lets see if we’re all happy enough with it. Things like saline seas, underwater caves etc. can wait, but there is one problem I think we should solve in this release: Making the transition from deep waters to shallow waters more gradual. Now this is probably way more complicated than necessary. Somewhere in between these two images lies the optimal input/output ratio. The question is: Where exactly? 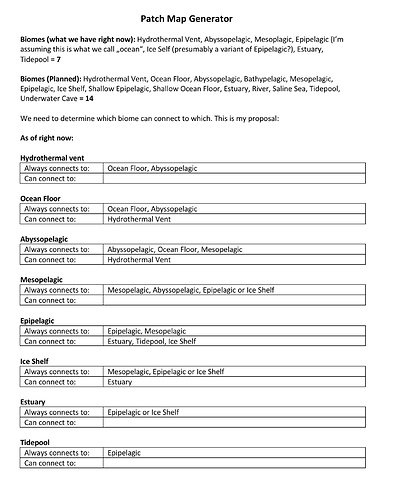 I like the rules list of which biomes can connect, that’s cool. I guess in terms of number of steps to move around that’s partly related to the species splitting discussion. If it takes 3 minutes to swim around and get enough compounds to reproduce and you can move to a new patch every 2 editor sessions then to move (vent -> abyss -> meso -> epi -> coastal) might take 24 minutes, which is a reasonable amount of time I guess. I’m not sure we’d want it to take that much longer. 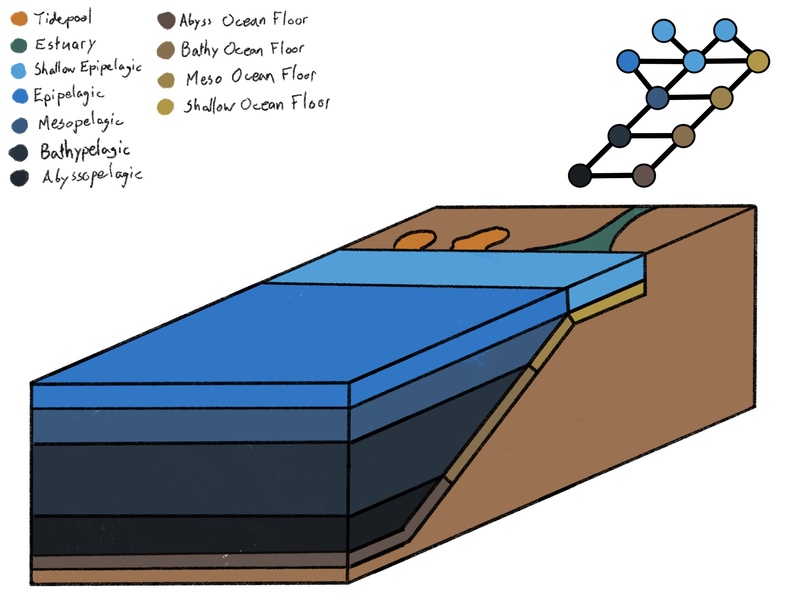 Re ocean floor depths we could do it continuously, so an ocean floor biome can be at any depth from 1m to 4000m if we like, rather than chunking up with titles. It’s an option. Maybe making those new ocean floor biomes is easier that it seems. We already have an ocean floor background so we’d just have to make 3 more versions of it, each increasingly lighter. Then in the patch map we could include one ocean floor patch for each ocean layer. So maybe they could appear in other layers besides the hadal zone, that would make colonizing the surface easier for phototrophs. Here’s another version which has subway style connections. All feedback welcome, I am not so happy with how it looks so that would be a nice thing to work on. Part of that is the random node colours. Looks really great! Yeah the main issue is the random colors, but that will be solved once we use icons with a coherent palette. I’ve been wanting to make a patch map gui concept for a while, I’ll see if I have some free time by the end of this week to to finally get to it.